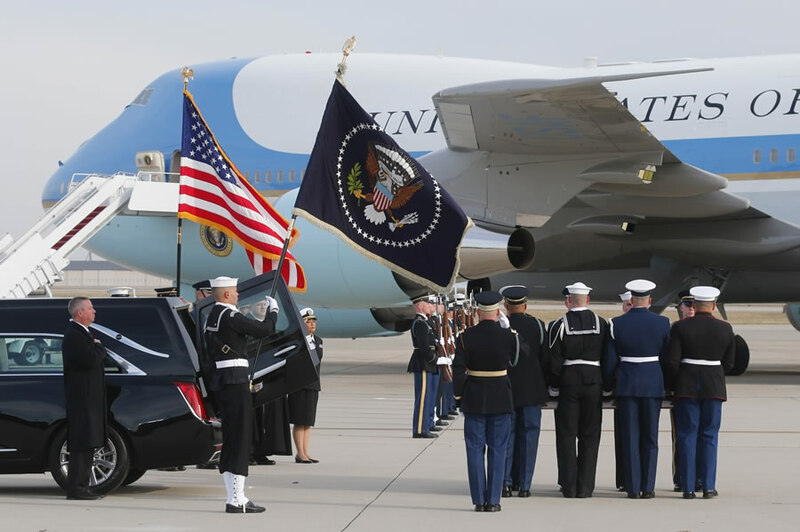 The flag-draped casket of former President George H.W. Bush is carried by a joint services military honor guard during a departure ceremony at Andrews Air Force Base, Md., Wednesday, Nov. 5, 2018. Hillary, as usual, continued to exhibit childish behavior by refusing to even look at Trump as he greeted Mr & Mrs Obama. Probably afraid he would shake her hand and give her cooties. Unfortunately, the issue cuts both ways. People who bash and malign others have trouble making eye contact afterwards. Thankfully, they have enough sensibility for that. I hope the gentility of the subject family and overall atmosphere make a positive impact for change with all who partook. The Bushes are not perfect of course, but they are a kinder, gentler family compared to current players on the national scene.